I wrote this in 2009. I am just now finding the courage to share it. It’s Mothers day weekend and I hope that you all enjoy reading this as much as I did remembering why I love my grama so much. She was by all means, to me, Mother Earth herself. Today I honor all of the beautiful life givers of this planet. Especially, my gram who taught me how to Love. My grandmother’s name is Zelda Pearl. To have known her, is to know why they put the word “grand” in front of the word “mother.” Yet it is only one of many words I could use to describe this genetically magnificent woman. My Gram was and still remains as precious to me as life itself. She spent a lot of her time raising me up, as my mom was very young when I was born. I guess you could say my mom was a baby raising a baby. My Gram was a farm girl and totally in tune with nature. As far as I can remember, she was always surrounded by a massive amount of trees, bushes, and flowers. As I got older, I would come over to visit her and there she would be, standing there cute as ever out in her back yard with her straw hat on tending to the plants that seem to give her life and breath itself. She was especially fond of the wild birds that came to visit her property… specifically, hummingbirds. Zelda Pearl’s mother, Julie Anne was born a Native American Indian. In Native American culture, a hummingbird symbolizes eternal joy and represents the Nectar of Life. Hummingbirds are a symbol for accomplishing that which seems impossible and when a hummingbird appears before you, it’s a reminding sign that you are the miracle that you seek. In addition, you are about to receive a healing through a self discovered freedom. My grandmother always had huge lush bushes and trees with vibrant red flowers. She would tell me that the hummingbirds like the color red and that they eat the nectar from these luscious flowers. My grandpa knew her love for these wondrous little creatures, too. So one day he made a homemade hummingbird feeder out of an old mason jar and hung it up out there on his favorite maple tree. Last year at “eighty eight” years of age and still sharp as a tac, my Gram closed her eyes, went to sleep, and I guess, made a deal with God that it was her time to go visit grandpa and the others that passed away before her. I was devastated. My heart felt pain and an emptiness that was indescribable. After her passing, I remained so shocked that I had moments where I would actually pick up my phone to call her, as I did everyday just to say “Hey Gram.” I had loss in my life but I didn’t want to believe that she was gone. For an extremely long period, it really was too much for me to accept. I tried everything I could to be close to her again. I even began to grocery shop at the same store she did. I know she was always trying her best to let me know she was near. To this day I still see the number eighty-eight everywhere I look. I know it’s her saying “hi,” making sure I know that although she can’t be here in her physical human form anymore, she will always be with me. I was blessed enough to move onto and take over the property that my grandparents worked over 40 years to build. Everyday I go out into the back deck and sit quietly, looking for signs that she is near. Yesterday was Mother’s Day. And by all means, my grandmother was my mother. I got up earlier than normal this day. I went outside and was sitting there staring at the little bush of red flowers I planted a few weeks ago. Then suddenly I saw her. One single beautiful little hummingbird appeared just for me on Mother’s Day. Oh the joy that consumed my heart! After one whole year of walking around searching and yearning for just a glimpse of a feeling of my grandmother again, there she was drinking the nectar from the little red tree that with all my love I planted just for her. The love I will forever have for her…the love that she will forever have for me. It all went into the creation of that moment. And even though that old homemade mason jar still hangs from Grampa’s favorite tree is all rusty and more like an artifact then something useful, it will remain there for as long as I am here. Some things should not change. Some things don’t need to change. Yet some things do. And it’s okay? Okay! She loved saying that word twice. There wasn’t anything pretentious about her. I would call her up and ask her something such as, “Hey Gram, what cha doing?” She’d say, “Oh, I’m just fiddling around the house doing some chores, okay? Okay.” Most of our daily conversations were short but meaningful. They would always end with Gram saying, “I love you” three times and blowing kisses through the phone. Her voice like soft fluttering wings, and just as the Ancients that held the hummingbird sacred for their tireless energy, anxiety, and swiftness of expression in joy and love, my beautiful grandmother, Zelda Pearl, taught me many a lesson. It seems that the one most important was that despite adversity, and believe me, this awesome woman knew many a hardship. 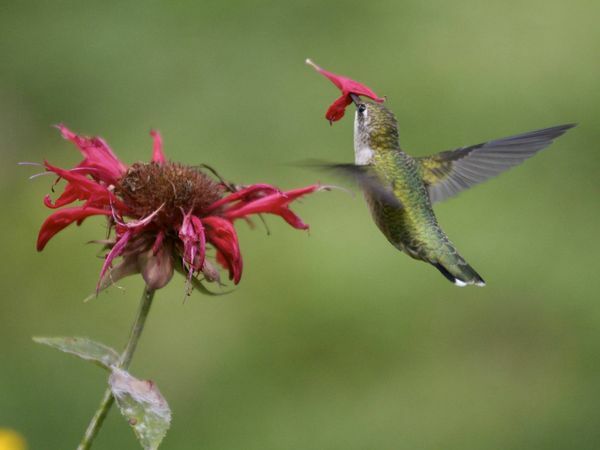 She, like the enchanting hummingbird, tells us to drink the sweet nectar of life. And do this with the swiftness of respect for vitality. For every drop supplies us with the precious taste of bliss and the love needed to sustain the sweet dance of our own personal existence. Her spirit lives on forevermore. In me, in her land, and the precious little gift I received on Mother’s Day. OH jULES, THIS JUST TAKES MY BREATH AWAY AND I AM CRYING BECAUSE I HAVE NEVER READ ANYTHING AS BEAUTIFUL AND TOUCHING AS THIS. SHE REMINDED ME OF JANE FONDA, WHAT A LOVELY WOMAN, I AM SO GLAD I GOT TO KNOW HER A LITTLE! BOTH MY GRAM’S WERE SO SPECIAL TO ME AND MY DAD’S MOM RAISED ME UNTIL I WAS 9 YRS OLD. GOD BLESS ALL MOM’S AND GRAM’S AND AUNT’S, THEY TRULY ARE SPECIAL! Your smile alone is enough to invoke great love within anyone who is blessed enough to experience it.